How do you practice the piano? 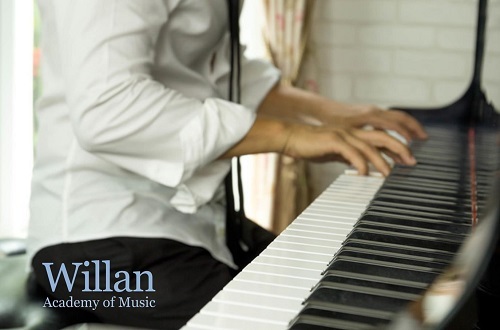 Even if you are taking a break from piano lessons over the summer, you should still continue to practice. This way you will keep moving forward with your progress. Here are some tips that will make piano practice fun again. When my students work on something new during their lesson, I encourage them to play through it again at home the very same day. Keep in mind that you don’t have to practice for a long time. If you wait for more than a day or two, sometimes your mind forgets what you have learned. Practicing every day for at least 10 minutes makes you a better pianist, but for many students, it’s just not fun. I remember staring at the clock waiting for my class to school to be over. Doing this during your practice time will just make your practice time seem longer, and you’ll be losing your focus on the music. It’s always a good thing to set goals and try to achieve them. Start by making a practice chart or purchase a practice record book. Make a list of your songs, warm-ups, and scales. Then check off as you complete the task. Seeing for yourself, as well as your parents and music teacher will encourage you to keep investing in your recorded practice time. Have you heard the expression, “Practice makes perfect?” Perhaps it’s better to rephrase this with “Practice makes permanent.” Whatever information you input into your brain, is what you are learning. So, if you practice something well, you will learn it well. If you practice your mistakes and repeat that particular passage several times, let’s say several notes or a few measures overall, you will learn it well. Practicing your mistakes with much repetition, then that is what you will remember. You’ll be fixing your mistakes by repeating the notes slowly and accurately. Take each staff at a time. What I mean by this, is to start with the right-hand melody notes, then go back and work on the left hand separately in the first line of music. Now, combine both hands, playing together. Patience and consistent piano practice is the key.